Upgraded Design of Modified Bitumen Storage Tank SBM-15 - GlobeCore Bitumen Emulsion. Very important among bitumen equipment are modified bitumen storage tanks. At the requests of customers GlobeCore engineering department upgraded the existing design of modified bitumen storage tank SBM-15. In particular a new structural design of a storage tank with downwards pointing cone bottom solves the problem of heat loss in the bottom part. Hollow part now has a heat insulation 200 mm thickness minimum. 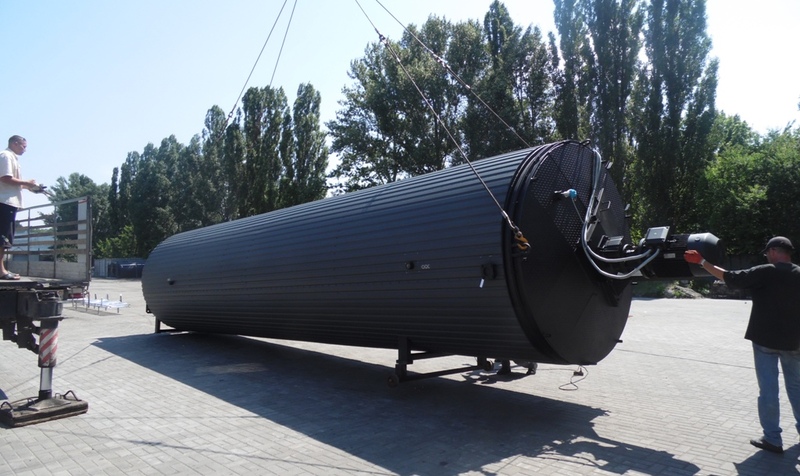 The new model has 500 mm less height (length) and now it becomes possible to transport two storage tanks by one 20 ton semi- trailer truck with interior dimensions 2,45 m х 2,6 m х 13,6 m. Operational capacity of modified bitumen storage tank SBM-15 has been increased from 15 to 15,5 m3. Roof shape doesn’t allow accumulation of rainwater. For safe operation it is covered with corrugated sheet, fitted with dismountable technological fence and with ledge around the perimeter. Inspection manhole now has a bigger opening and is equipped with non-removable grill. For measuring height of bitumen level in storage tank there is a membrane pressure sensor. Its block is mounted at the bottom of the tank. Sensor readings are shown on the control panel. To control temperature of bitumen there are two shell cases with temperature sensors located at different depth in a tank. Control cabinet now has a design with two doors. Control panel with indication tools is installed on the inside door. The external door prevents dust and rainfall gets to control panel. It has an inspection window that allows monitoring sensor readings without opening a control cabinet. New design also includes emergency overflow pipeline preventing spillage of hot bitumen in emergency situations. This inlet can also be used for additional bitumen circulation. To prevent buckling of outside plating while mounting a tank into operational position – a lower support has been added with cylinder fixing pole which is can be used a transportation support. To learn more about technical specifications of the improved modified bitumen storage tank SBM-15 press here.